3 Story House for Sale or Lease at Panadura. Valuable Property for Sale Payagala, Kalutara. Residential Luxury House Located in Panadura. Property for Sale in Wadduwa. Complete House for Sale at Siri Niwasa Mawatha, Kalutara North. Fully Furnished House for Sale or 99 Years Lease in Kalawila, Beruwala. Export Oriented Award Winning Modern Fish Project for Sale at Ingiriya, Horana. 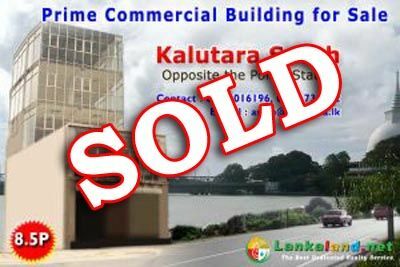 Prime Commercial Building for sale KALUTARA.